Here, you can find all of the music that is played by the Purdue Drumline. While Purdue University does not have a School of Music, the Purdue Drumline, along with all facets of Purdue Bands & Orchestras, consists of some of the best musicians in the nation. We pride ourselves in not only being excellent drummers and marchers, but also the best percussionists and musicians we can be. There's a reason the "All-American" Marching Band has been invited to perform on numerous world stages. From leading the 2010 Macy's Thanksgiving Day Parade to the St. Patrick's Day parade in Dublin, Ireland, this drumline has performed in front of millions of people. This level of musicianship does not come easily, and these opportunities do not present themselves to everyone. The music you will find here reflects the high level of musicianship required to be a part of this drumline. Everything here, from warmups to cadences, requires talent and work to be able to play. If you want to be a part of this drumline, or any musical program here at Purdue, you must work hard. Below, you will find a basic introduction to practicing and performing, along with standard rudiments, drum cheers, and sheet music corresponding to each instrument. There's a lot of music on this site. We understand. Work hard, and you'll be fine! - Memorize all of them. These can be found here. Dr. Nave will ask you to play a number of them. Rehearsing multiple hours a day and performing through 10-hour game days, the Purdue Drumline is constantly playing. To stay healthy, warmups are not only important, but required. The entire line plays these warmups, both together and as individual sections. Learn them. Memorize them. They will become second nature. Those in the top row are crucial, we may get to the ones in the second row so they are also good to be familiar with. When parade marching (marching the band from one place to another), the drumline plays a preset list of cadences, with fight songs and other songs placed between and played at the cue of the drum majors. This list of cadences is referred to as our 'Cadence Sequence'. The cadence sequence is what we play a vast majority of the time that we have drums on. The current cadence lineup consists of six main cadences. There is no way to hide if you don't know the music when interacting with your audience. These will be memorized. Know these cadences. In addition to learning the audition cadence, cymbals will need to learn a prepared visual which can be found here. The cymbal handbook is also an excellent supplemental tool to get ready for camp. The All-American Marching Band performs a pregame show at every home football game. For the vast majority of games, this show will not change, but there are many aspects that can adjust for events like flyovers, presentations, and other events that take place before the game begins. We will be learning this show on the last day of band camp. There will be no time to learn this music during band camp, so it all must be memorized before you come to auditions. Since all auditionees go through band camp, even Boiler Beats members will have to memorize this music. Here is the music for the AAMB pregame show. It is possible that there will be some variations to the music on game day, but this is the foundation for our show. Many of these pieces are also played as the band marches from venue to venue every game day, or in any other parades the AAMB participates in. The All-American Marching Band plays three different Purdue fight songs. The main one, 'Hail Purdue', is our famous school song, while the others, 'Fighting Varsity' and 'For the Honor of Old Purdue', are played often in various situations, including the pregame shows. B-Store - B-Store is a very simple, triplet-based cadence that the drumline plays to march the band off the field at the end of pregame performances. Tuba Cadence - Featuring the AAMB Tubas, the band 'takes a break' before erupting in an all-out sprint while playing this cadence. Go Purdue - A fan favorite, Go Purdue is a simple, catchy cheer that is not only played during pregame, but during every short break when there's a lull in the action. Drum Major Breakdown - Every game day ends with the Drum Major Breakdown. We play this simple cadence while the band leaves in a spectacular combination of athleticism and show. We also have a series of short 'drum cheers' that are played by the AAMB during shorter breaks and by the Boiler Beats for tailgating fans. The rest of the AAMB has various hand movements, spoken words, and dances that correspond with these cheers. These cheers are really made to fill time, so that there is never down time wherever the band is or wherever the Boiler Beats are performing. These are simple, and there is no reason they shouldn't be memorized. However, they are not top-priority, and we will spend time learning them during band camp. 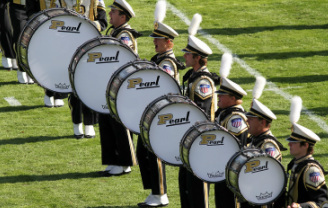 Over the years, many student-written cadences have been played by the Purdue University Drumline, and are no longer used in our cadence sequence. These cadences most likely won't be played again, but are very good practice tools. Feel free to practice them, but don't worry about memorizing them. They won't be a part of any audition, but you never know when you might see old grooves in new cadences!